Telephone wires were originally designed to carry "Commercial Speech" between your home and the telephone exchange. This uses a band of frequencies from 300 to 3400 hertz. this system is called PSTN (public switched telephone network). ADSL uses frequencies very much higher than this speech band to carry fast data traffic. ADSL systems use typically frequencies between 25 kHz and around 1.1 MHz. Because PSTN and ADSL systems operate at different frequencies, they can be carried though the same wire pair at the same when the operating conditions are right. Voice calls operate between 300Hz and 3.4KHz, and include also DC power (0-72V DC at on-hook condition, typically 0-60 mA current and lower voltage at on-hook) and rign voltage (typically 40-80 V AC at 20-25 Hz freuquency). The voice telephone system is matched to 600 ohm (or close to it) impedance at voice frequencies. ADSL technology operates between 26KHz and 1.1 MHz and is designed for around 100 ohms impedance. Because the two frequency spectrums do not overlap, it follows that both data and voice can be present at the same time on a single pair of copper wire. The different impedances have hostorical and technical reasons. The impedance of telephoen wiring is typically around 100-120 ohms at the frequencies ADSL system uses. The cable impedance is somewhat higher at voice frequency range, considerably higher than 100 ohms, and where where historical 600 ohms impedance comes to picture (cable might not be exactly 600 ohms for voice, but that's what devices are designed for). When ADSL and PSTN work at the same line at the same time, the electronics inside a normal telephone can be problem for high frequency ADSL signals: the ADSL signals can be attenuated (high capacitance on telephone input, possible resonances inside telephone, impedance mismatch) and ADSL signals can be heard as noise on some telephones (phone electronics demodulates high frequency signal outside it's operating range to voice frequency noise). In order to keep these systems apart and stop them interfering with each other it is necessary to separate the two components from the telephone line in your home. This is where the Filter / Splitter comes in. The ADSL POTS Splitter / filter allows taking the full advantage of the 1.1MHz copper line frequency spectrum, by stopping the telephone and ADSL systems from interfering with each other. 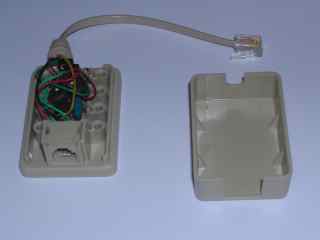 An ADSL filter is normally a small plastic box with a short lead that plugs into your phone socket and two outputs, one for your ADSL Modem and another for a telephone. Some filters have only one telephone output in them. ADSL filter select the band of frequencies for each of the outputs, phone or ADSL, and send just the correct band to the appropriate socket. The phone output gets only telephone frequencies (from DC to 3.4 kHz) and the ADSL output gets the higher freuquencies well (above 25 kHz). For good system performance it is very important that all your other telephony equipment is separated from the ADSL signals by the use of a splitter / filter -- this equipment includes telephones, answering machines, "normal" computer modems, etc, etc. All phones or other equipment must pass through a filter. Make sure that the ADSL signal is only passing through one Filter / Splitter. It can be the same Filter / Splitter for all of the phones. The signal to telephone output is generally just low-pass filtered so that voice frequencies (frequencies up to 3.4 kHz) get nicely though, but higher frequencies gets filterted. This filtering generally consista of LC low-pass filter designed to some suitable operating frequency between 4 and 20 kHz (between voice and ADSL bands). This kind of filter causes that the high frequencies of the ADSL signal will be severely attenuated (usually by at least 30dB with a good filter) so the signal reaching your telephone equipment does not contain such amount of high frequency signals that could cause noise. The telephone LC filter is also designed in such way that the filter impedance towards the line that carries ADSL signals is high at the high frequencies, meaning that those telephone equipment and cables related to them look like they are look to high freuquency signals that they would ne "disconnected from the main line". line. The ADSL POTS splitter is simply a series of coupled inductors and parallel capacitors forming a low pass filter that attenuates the higher frequency ADSL data and permits only the voice frequencies to reach the telephone. The series inductor shows high impedance to high freuqencies, so the ADSL signals on the line are not attenuated. Return loss at voice frequencies (against 600 ohms) would be should be good enough. The ADSL output from filter (if it has such thing) is generally unfiltered line signal (normal home ADSL devices are not to be bothered with line voltage and voice signals. 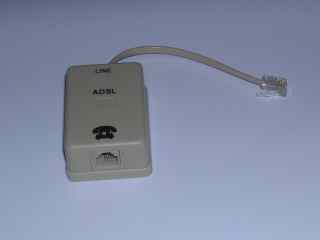 When the operator install ADSL system to the central office, they install ADSL splitter filters on the central office end of the telephone wire. The filters at the central office have basically the same functional needs as the home units, they need to be able to keep different signals separate, and separate those two signals to different outputs. Typical central office ADSL splitter filter is a device that ghas many filters built into one package. For each outgoing line there is one PSTN connection (goes to centeral office telephone central equipment) and one for ADSL connection (goes to DSLAM rack that terminates ADSL connections). Typical ADSL splitter in central office has series capacitors (blocks telephone line DC well, attenuates ring signal sonciderably, but passes ADSL signals well) between line and ADSL output going to DSLAM. Because ADSL splitter filter connects directly to the subscriber's loop media, it must also provide some surge protection from externally induced voltage which could damage any attached equipment or endanger humans interacting with the installed equipment. The ADSL splitters in the central ofice typically include overvoltage protection components to protect the ADSL DSLAM agains overvoltages on the line. Some filtered ADSL outputs provide protection from the high frequency transient and impedance effect that occur during POTS operations (ringing transients, on-hook, off-hook transient and so on). The following photos, circuit diagram and text try to describe how ADSL filter sold by ELEXI (product number 440072 "ADSL puhelinsovitin USA/USA GP4C") works. This ADSL fitler is picked as example because I happened to own one and the construcion of this filter is quite simple (=easy to understand). Photo 2: Close-up of the circuit board iside the filter. The telephone line connecting wires go to top right and the wires going to telephone connector leave at bottom left. Figure 1: Circuit diagram of the filter circuit board electronics. The phone line to central office (that carries ADLS and PSTN signals) goes to the left side of this filter and the phone goes to right side. This filter consists of an LC low pass filter made of the series connected coil (total impedance of 10.260 mH per wire) and the 22 nF capacitor across the wires. Those form the actual filter. 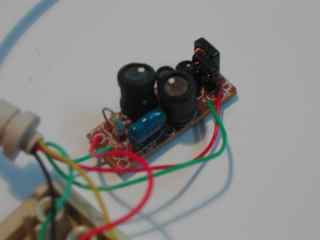 There are resistors after this LC filter to make the filter properties have proper impedance matching for voice frequencies (should be around 600 ohms). This filter seemed to have one 1A fuse on the output to protect the circuit agains some catastrophic damage (what this would protect agains..). The total series resistance this kind of filter cause to one telephone wire was around 45 ohms, meaning that having this filter adds around 100 ohms to the telephone wire resistance. The series resistors and internal coil resistance reduces the impedance mismatches that just putting a capacitor across telephone, wires would cause. If we take a look at the circuit construction with only resistances and capacitances in it, it is pretty close to a simple model of 0.5 km of 0.5 mm telephone cable wire. The coil impedance at voice frquencies would be at 20-200 ohms, causing some mismatch and attenuation at high telephone frequencies. The capacitor has impedance of aroudn 250-2500 ohms at voice frequencies. Return loss at voice frequencies (against 600 ohms) would be acceptable with this kind of circuit. The coils in this circuit are built to ferrite cores, boppin cores for highest inductance values and the 40 uH coils are wound to small ferrite toroids. My quess is that the coil part is constructed from three separate coils to make the filter to work well at high freuquencies. The 10 mH coil has lots of turns, so at high freuquencies it's perfomrance might not be best (potential coil resonances etc. ), but at those high freuquencies those smaller value coils have already attenuted the signal enough. Getting three different coils in series gives best performance on all freuquencies.